The Cobblestone Museum is pleased to announce a hands-on Historic Masonry Workshop with Brian Daddis Masonry on Saturday, March 16 or March 23. 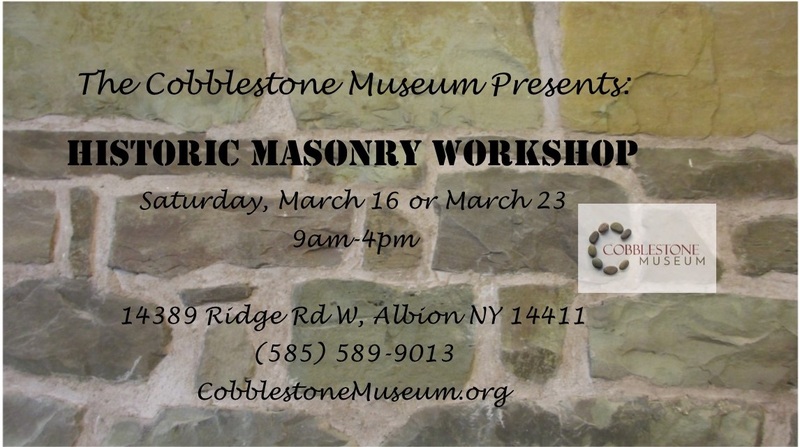 The Masonry Workshop will take place at the National Historic Landmark Cobblestone Schoolhouse in Albion NY. The full day workshop will focus on the repointing process for reconditioning mass stone composite basement walls. Also addressed will be the different methods for removing the old mortar, mixing lime mortar, placing fresh lime pointing mortar, curing the lime mortar, and finishing techniques. The hands-on portion of the workshop will be preceded by a classroom session that will discuss the definition of historic masonry and the importance of reconditioning it using lime mortar. The Masonry Workshop is the second in a series of Historic Preservation Workshops presented by the Cobblestone Museum. In 2018, the Museum partnered with the Landmark Society of WNY to offer a Historic Wood Window Repair Seminar. The cost for the full day Historic Masonry Workshop is $100. Cobblestone Society Members are $90.